I’ve been having fun sketching Viking Rus embroidery designs from period sources. Their artwork, as I may have said before, is this amazing mix of Viking, Byzantine and Eastern. I’m still researching on the stitches they used, but I haven’t yet found enough to post anything. Here’s a new design. It’s based on a sword hilt from 11th century Ukraine. Between 2 days of homeschool co-op and one of my best friends getting married, it’s been a busy couple of days. I’m just posting a new Rus Viking embroidery design based off of an 11th/12th century piece of Rus embroidery. Documentation to the piece will come later. Enjoy! I’m still working on research on Rus sewing techniques and embroidery methods, especially those not gilt or bead. From what I’ve learned, it is different from the contemporary techniques we’ve found in western Scandinavian lands. Not sure if I would call it more complex, but it certainly has a level of complexity I did not expect to find in 10th and 11th century textiles. First, I finally got the fabric I’m going to use for the side-laced cotte dyed!! I love the color! I was thinking it would be a bit more blue-ish, but I am pleasantly surprised by the results. I put it next to my white muslin for comparison. My first mock-up of the embroidered pleated apron is done! 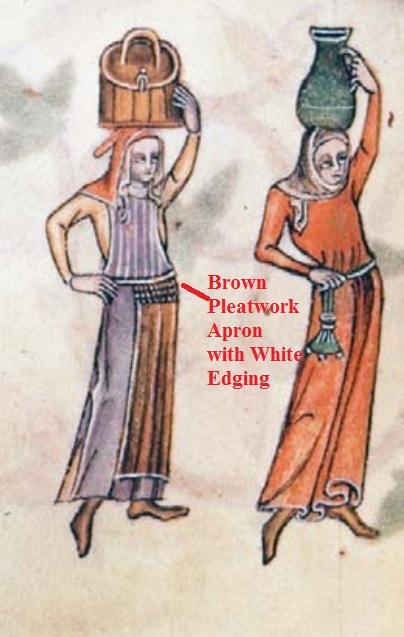 It’s a style of aprons that popped up around the mid 14th century and lasted until the late 16th century without changing much in style. I found a couple of new pictures demonstrating the over 200 year range of this accoutrement. 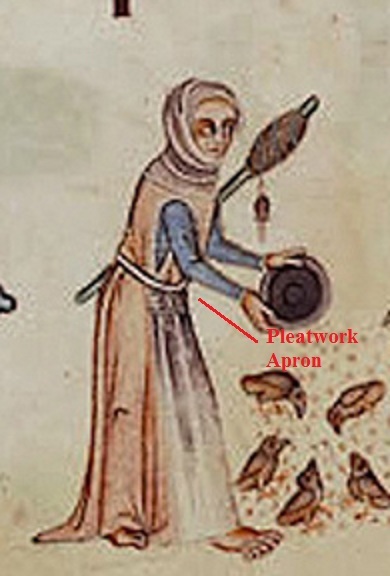 What I like, other than the bling quality, is that it makes the simple apron not so simple and allows it to be worn with fancier garb. Last time I left off, I was having problems simply getting the dots straight. Here’s what I worked out. That green thing in the upper right is a home-made Bat-a-rang I made for my son’s birthday party 3 years ago. I still find those things everywhere! 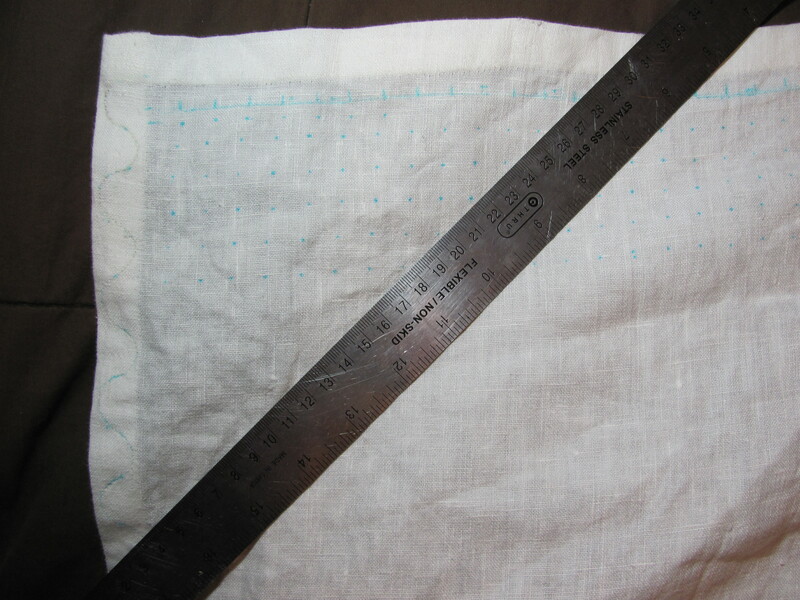 I squared the edges on my large fabric cutting board and used the marks to make a line nearly across the entire apron every half inch. Half an inch was too big on one of my previous attempts, but with the method I’m trying, it’s perfect. 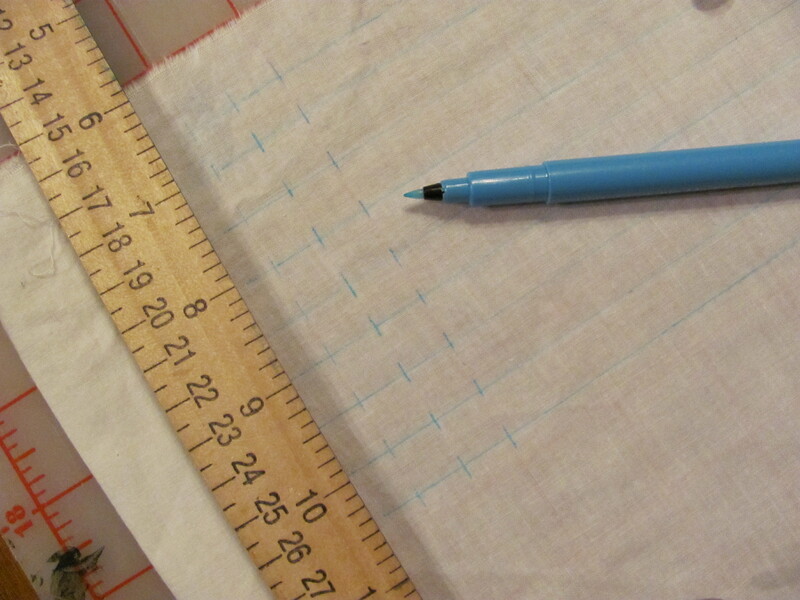 Keeping the fabric still lined up on the mat, I marked every 1/2″ in the perpendicular direction. 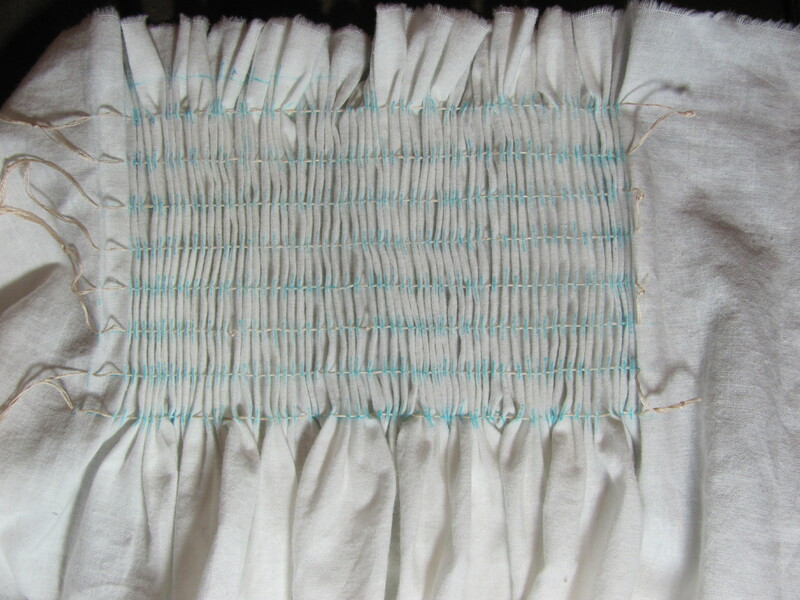 The fabric did slip quite a bit, so generally between each row I would re-straighten it on the mat. It doesn’t matter how many rows you make, but it needs to be an even number (we’ll get to that later). At this point, I have eight long lines going across, and about 70 dashes going up and down. 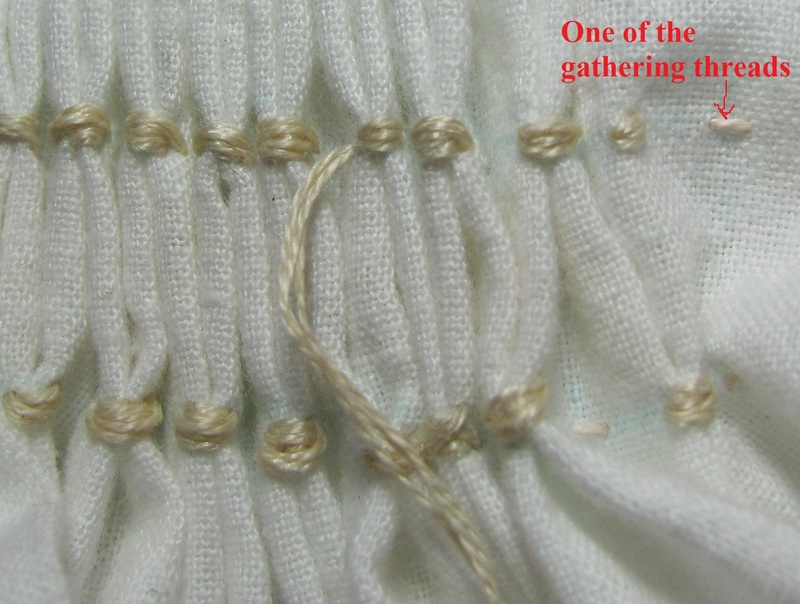 Somewhere I read a tip that said do all of the gathering stitches at once. 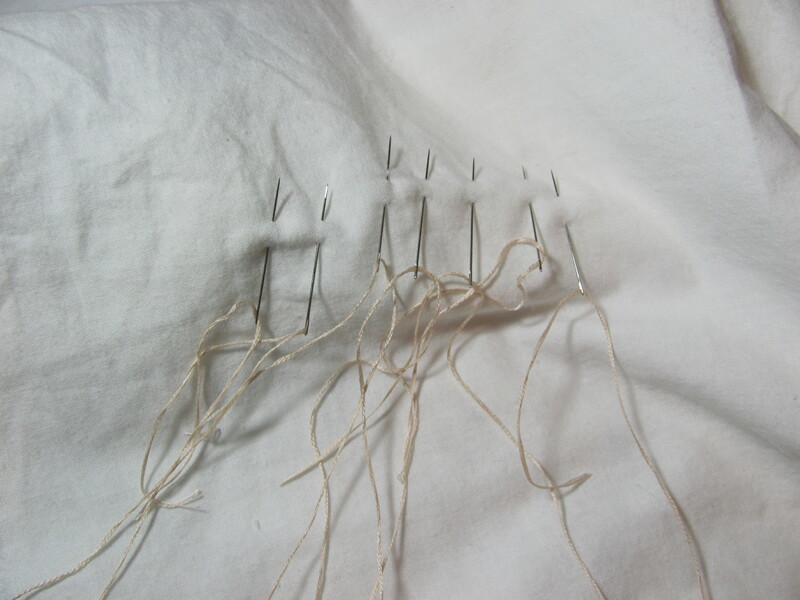 So I threaded 8 needles – I used sharp, medium length embroidery needles. I used normal DMC embroidery floss in a light, but not white color. Avoid the urge to use a completely contrasting color, like red. 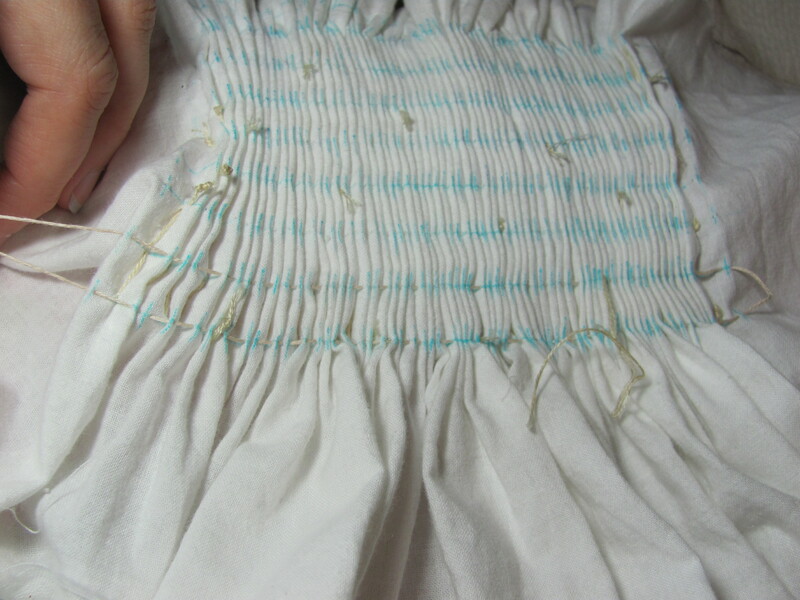 I did that with the cartridge pleats on my partlet, and when I pulled them out, it left red residue in the holes. The method I used was I ran along the length-way lines. A smidgen before every dash, I pushed the needle through the fabric. 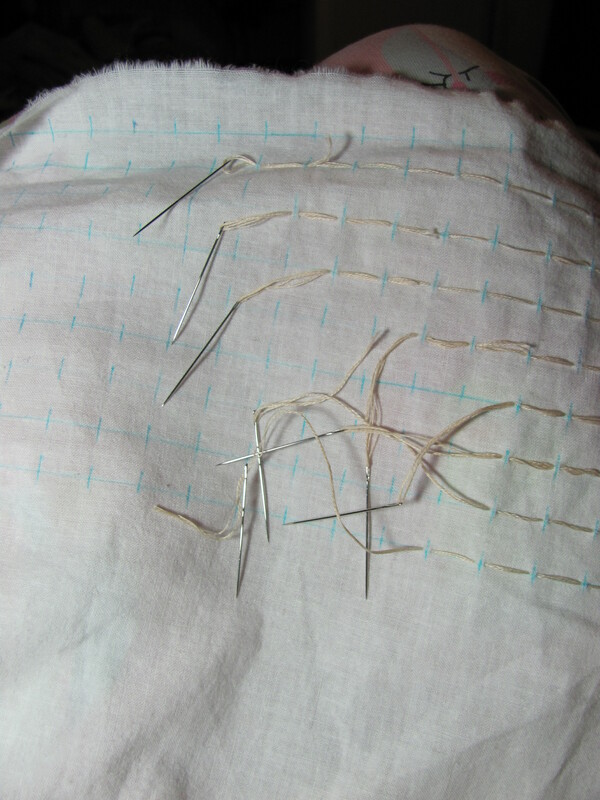 Using the same motions used in a running stitch, right after each dash I came back up. 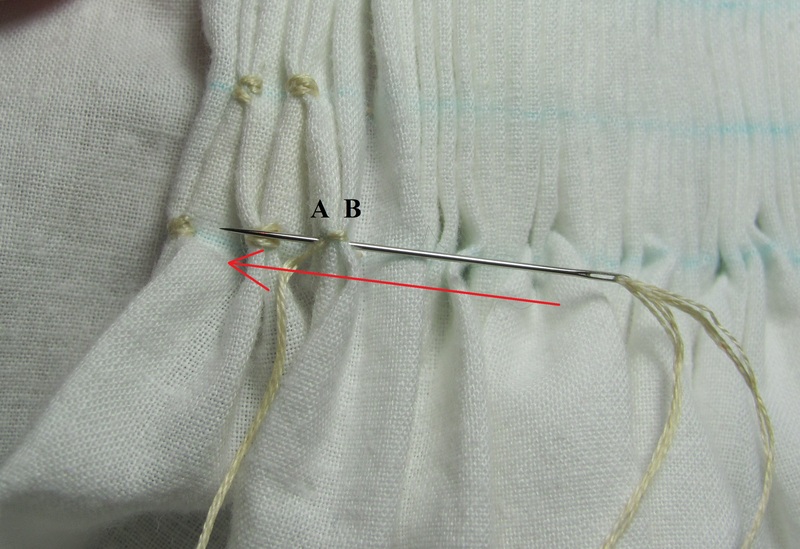 Tie the back ends of the thread together in batches of 2 and 3. It makes it easier to adjust when gathering the fabric. When you get to the end of your threads, but still have more line to finish . . .
Start pulling the gathers. That’s why you tied the threads off at the other end and why it’s easier to work all 8 rows at once. When I finished gathering the gathers, I thought that it looked way too small. I knew that I wanted the apron wider than this. So I set about spreading the folds and trying my hardest to keep the columns straight. 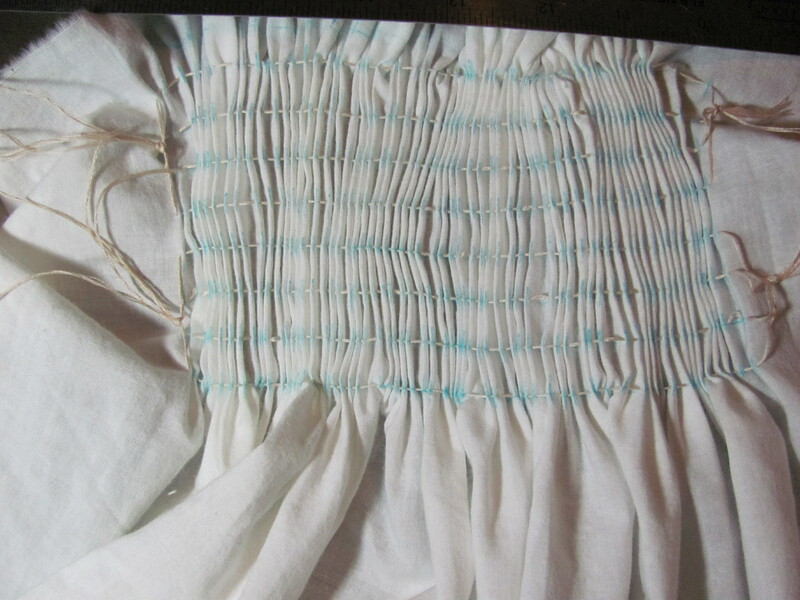 Then I laughed and realized that the smocking will loosen the gathers. 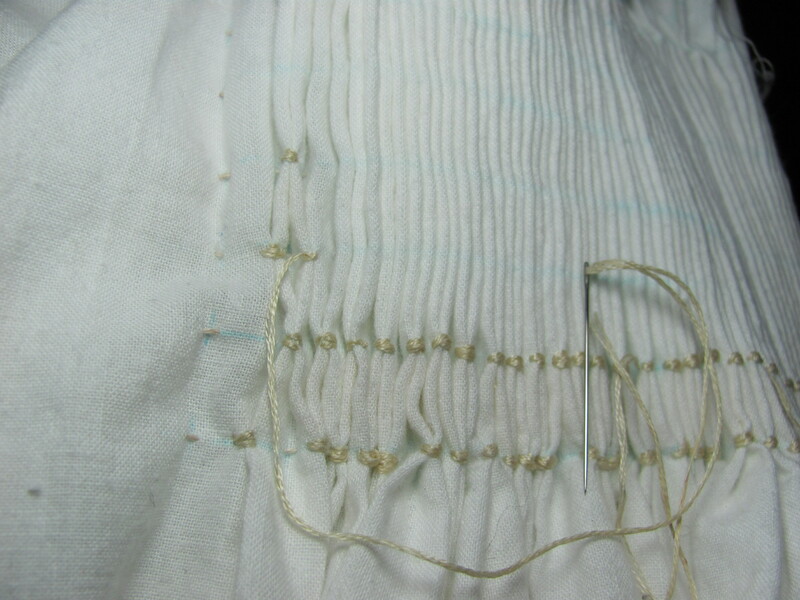 I re-pulled the threads together, although not as tight as I did at first. 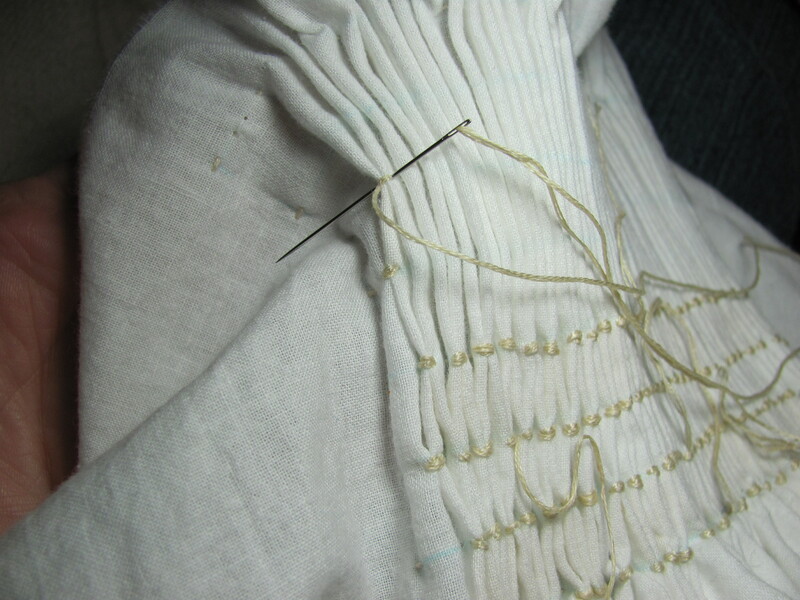 Take a chop-stick, or something like it, and pock into each pocket created by the gathered threads. It is tedious, but when you are done . . .
all of the rows line up nicely, and . . .
the front looks just lovely. 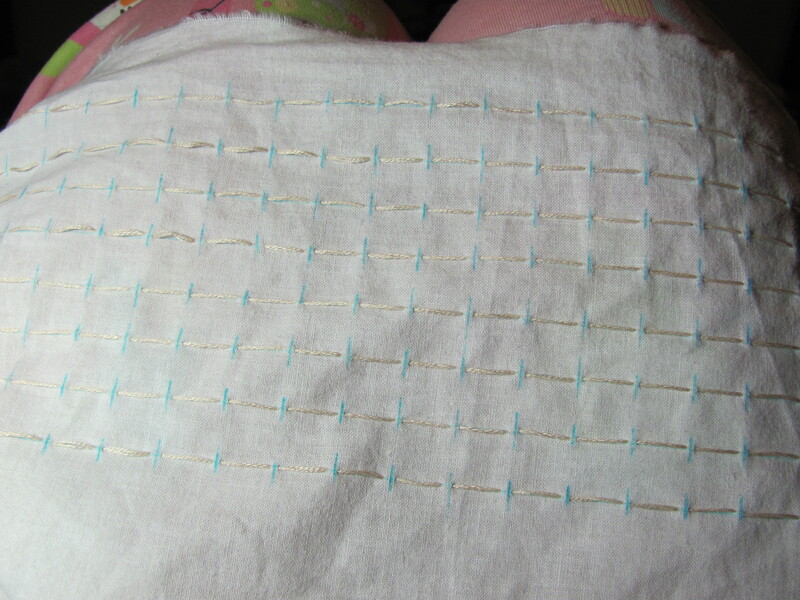 Now for the smocking. It helps if you understand the pattern first before the stitches. You are working with 2 rows at a time. That’s why you made an even number of rows. I labeled the columns to make it easier to understand. Remember: rows go side to side. Columns go up and down, like columns on a building. It’ll get confusing if I don’t make this distinction. 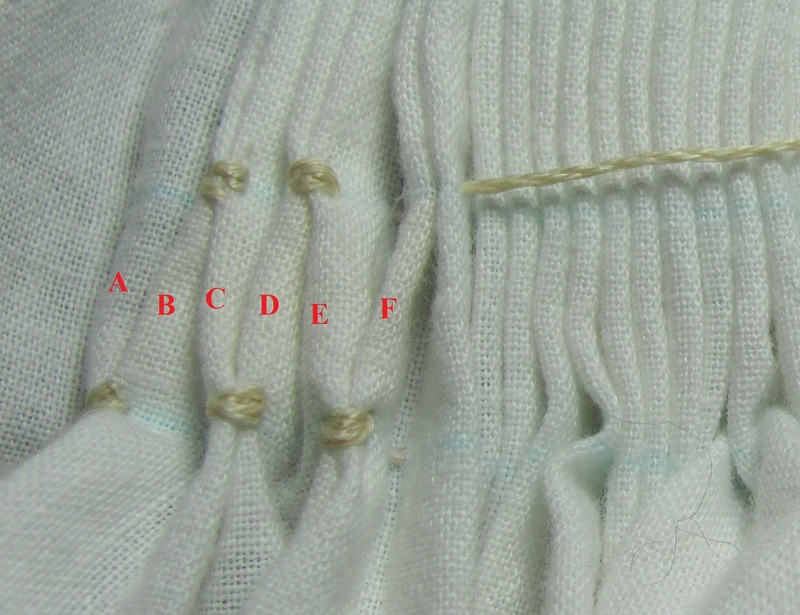 At the bottom left corner, Column A and Column B get stitched together. (Stitch explanations come in a minute). Then go up one row, and Column B and Column C get stitched together. Go back down one row and Column C and Column D get stitches together. Go up one row and Column D and Column E get stitched together. And so on, and so on, until you finish those 2 rows. 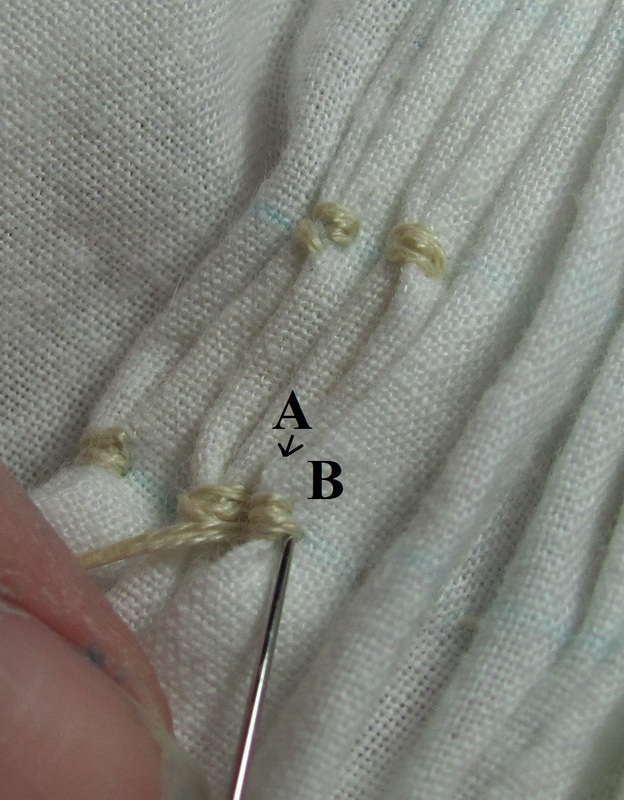 Bring your thread up from the bottom on the leftish to middle part of the top of A. In this case, A is not at the end. 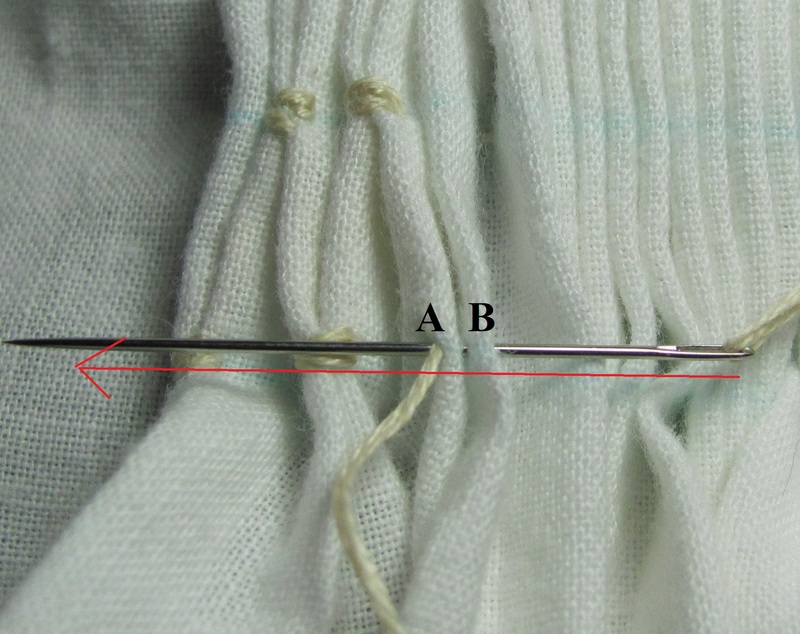 Bring your needle around the other side of B and push it through both A and B. Do that one more time. 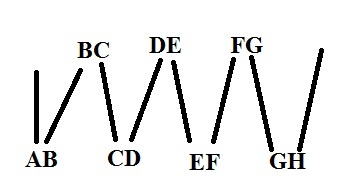 Bring the needle around to the other side of B and go through B and A. Now bring the needle around again, but this time slip the needle into B only. You are going to run the needle up B to the row on top of it. BUT you are doing this under the cloth. Now you are going to do to B and C what you just did to A and B. And then come back down C to the first row. Now repeat with C and D. And then with D and E. And so on. 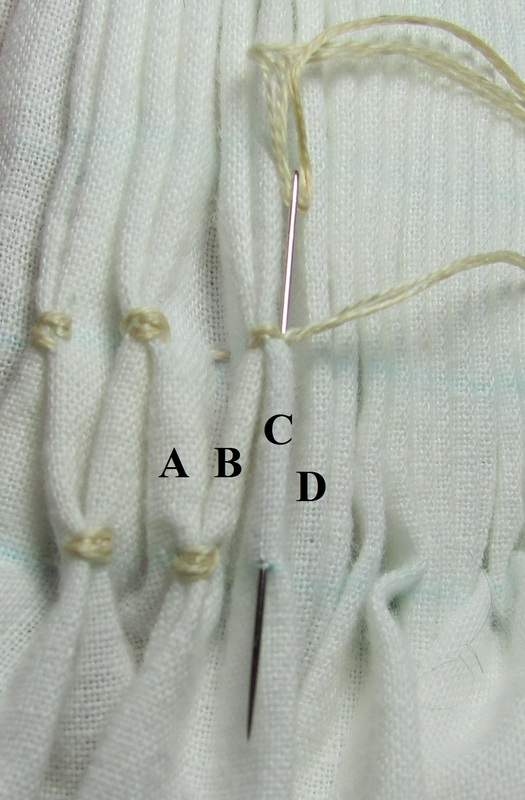 Connect the last two together and then tie your thread off underneath. Ignore the thread in the middle, it’s just a loose thread that got into the frame. Whatever you do, do NOT, I mean do NOT, just move on up to Row 3 and think you’re going to just work your way back to the left. It does NOT work that way. Yeah, I learned that the hard way too. Go back to the beginning of Row 3 all the way on the left. Repeat again for Rows 5 & 6, and then 7 & 8. After the first two or three, I grew tired of having to tie off the loose threads in the back. 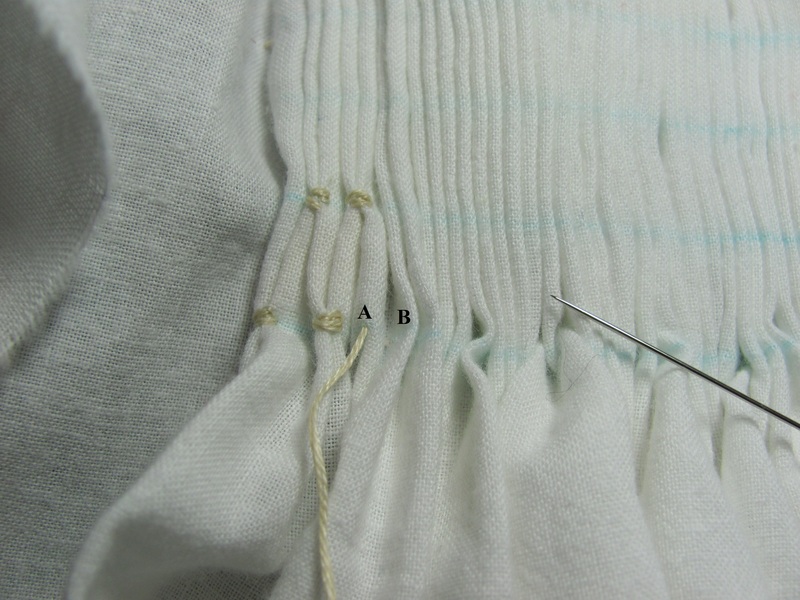 The pleats are still fairly tight, and that made it a little more difficult. 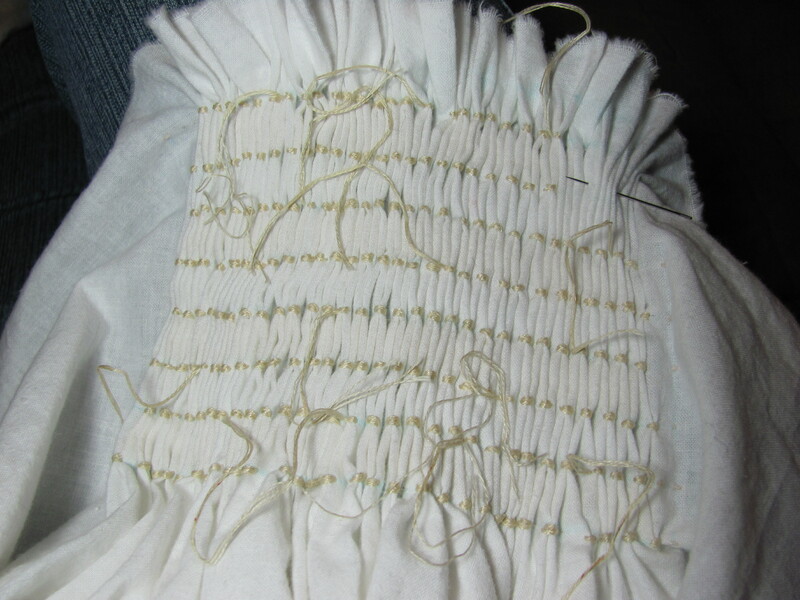 Once I was done with the smocking, I took out the gathering stitches. 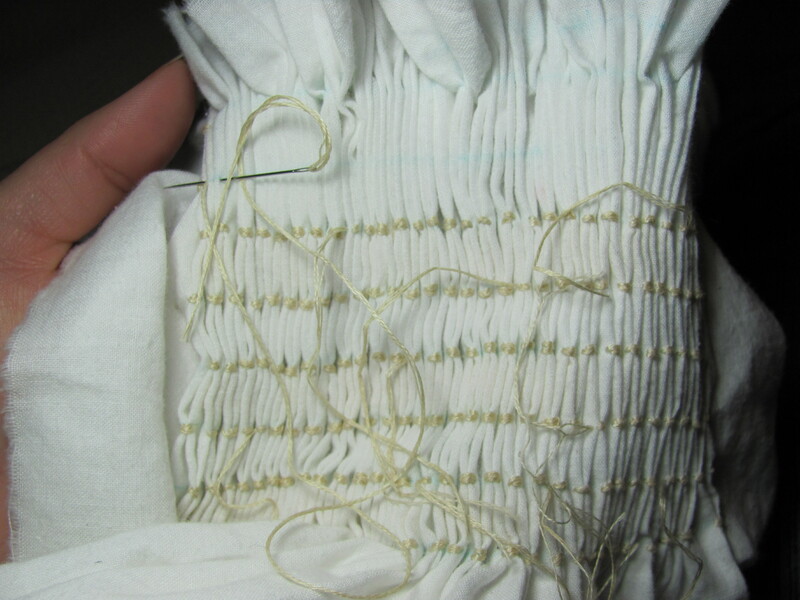 Then I tied down all of the loose threads. 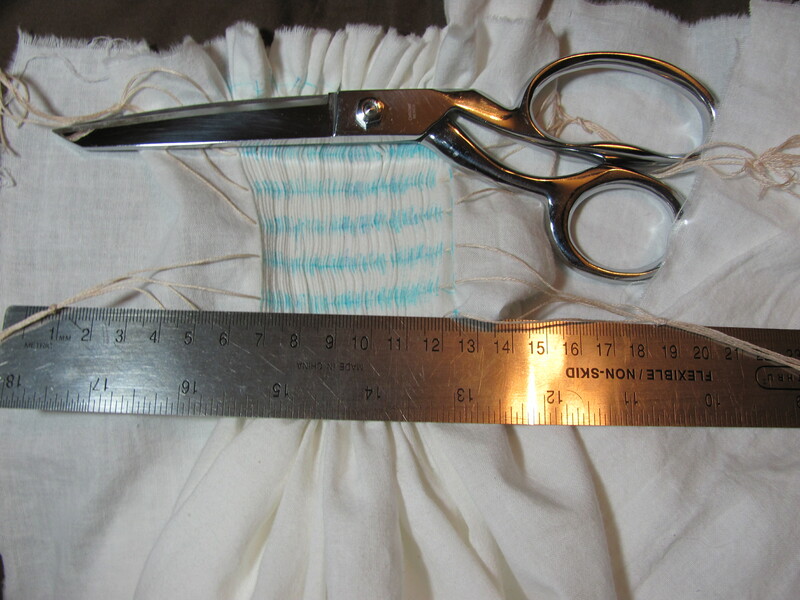 All that was left was to hem it and add the apron ties and waistband. Do I like it? Yes, I think it is beautiful. Can I improve on my techniques? Absolutely! Even looking back through the pictures I saw a couple of things I can do better on next time. 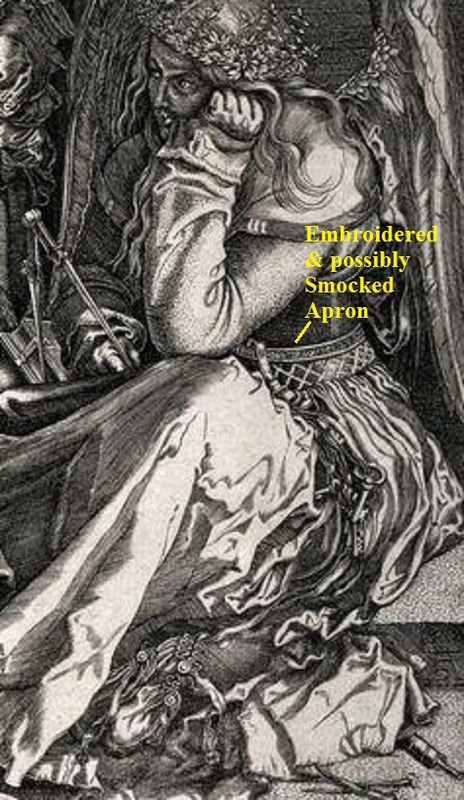 All-in-all, smocking can be fun! I take back all the bad things I said about cartridge pleating and blackwork counted stitch embroidery. Smocking! That’s the real pain in the tush! It’s for the decorative apron I’m making for my Christmas Revel A&S entry. It’s a project for which I have the documentation. It’s not so big that it’ll take months and months to complete, but it has a degree of complexity. Yesterday, I looked over the documentation. The pleating part looks like cartridge pleats but on a larger scale. I figured that since I know how to do cartridge pleats, this should be no problem. Wrong! 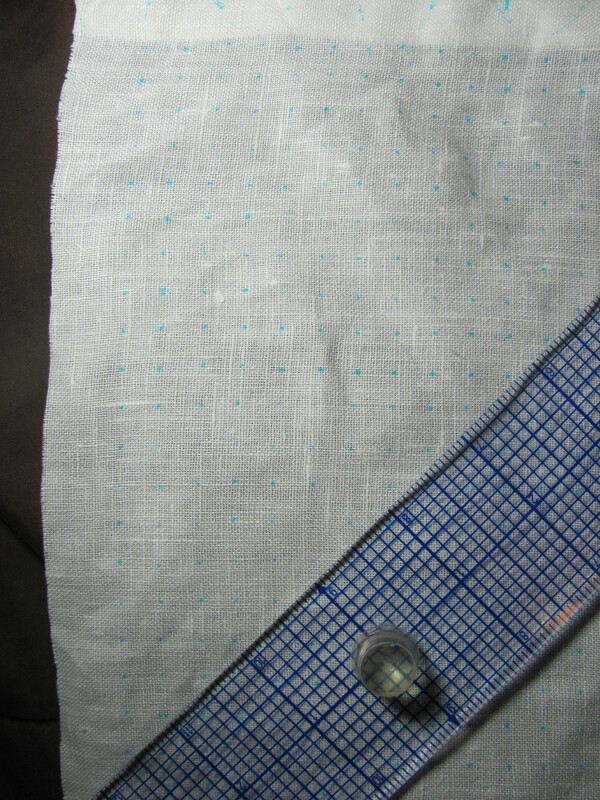 My problem is that it is so much larger and getting the pleating marks even is not easy. Ignore the squiggly on the side; it’s part of an abandoned project. As you can see, the dots are no where near even. At first I was trying to use the edge to make the dots line up. I gave up on that and drew a base-line to use. Still, even with my fancy ruler they would not line up. Plus I was making the dots 1/2″ apart, and after thinking about it (and 5 hours of cursing) I wanted them closer together. It really didn’t help that I was doing this on my lap, using a large cookbook as a table. I was kind of in the middle of a Psych marathon with my 14 year old and didn’t want to get up. The dots may be hard to see from the faintness, but they are much straighter. 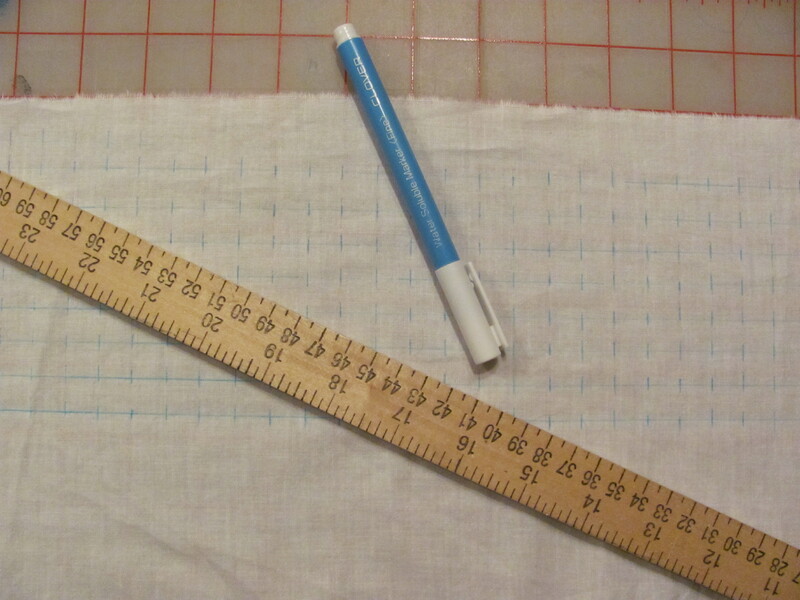 I used my favorite ruler that let me see through to match up the now straight fabric edge to the measuring lines. It’s not perfect, but it’s not bad. It still took over 4 hours to do (and I’m not quite done yet). 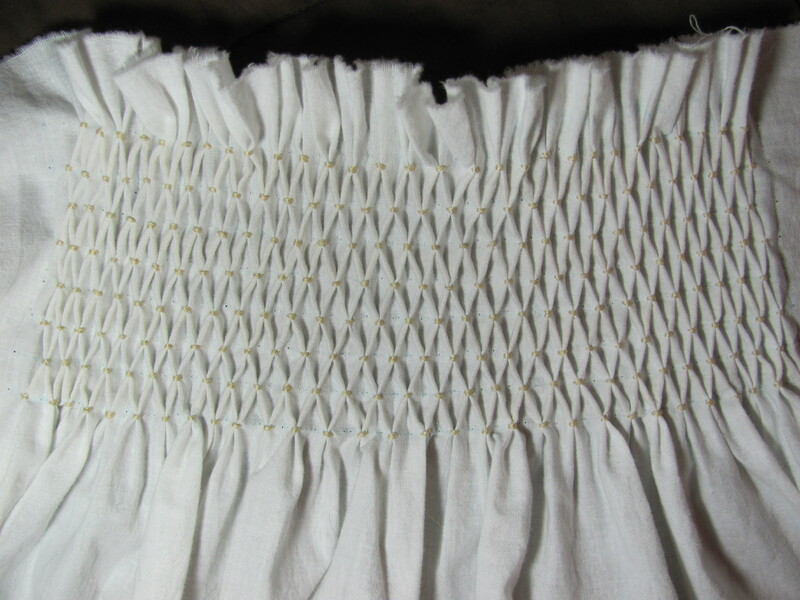 All of this work left me a little anxious to get into the actual smocking, but I realized that I was still unclear about some of the details. Sometimes before you can learn something new, you need to figure out what not only what things are called, but what questions you need to ask. So I needed to hit the books again and do a bit more research. My first question was how do you get the pleats (and/or) dots even without going insane. Turns out that it’s not that easy. My having problems with it wasn’t unusual. In fact they make specific tools just for getting the dots even when smocking, such as iron-on smocking dots and dot templates. 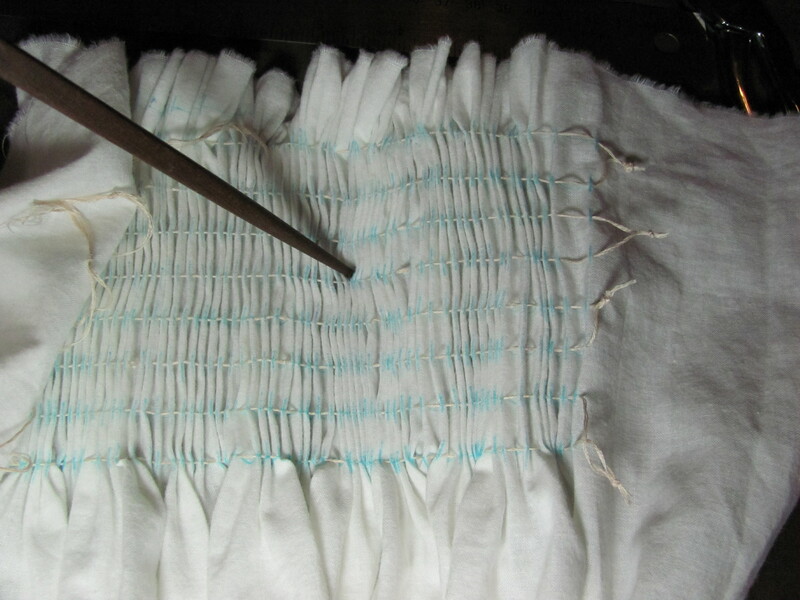 They also make machines that do nothing but make the pleats for smocking. Wow! So I’m not such a nutter-head for having a difficult time doing this. I got some tips and thought of a couple of creative ways on my own to make the dots even and less time consuming. More on that later. When making the pleats, does it matter if I work from left to right and from top to bottom? With the dots, do I go up one hole and down the next? Or do I go down slightly to one side of the hole and up slightly to the other side (or vice/versa)? What about needle angle? 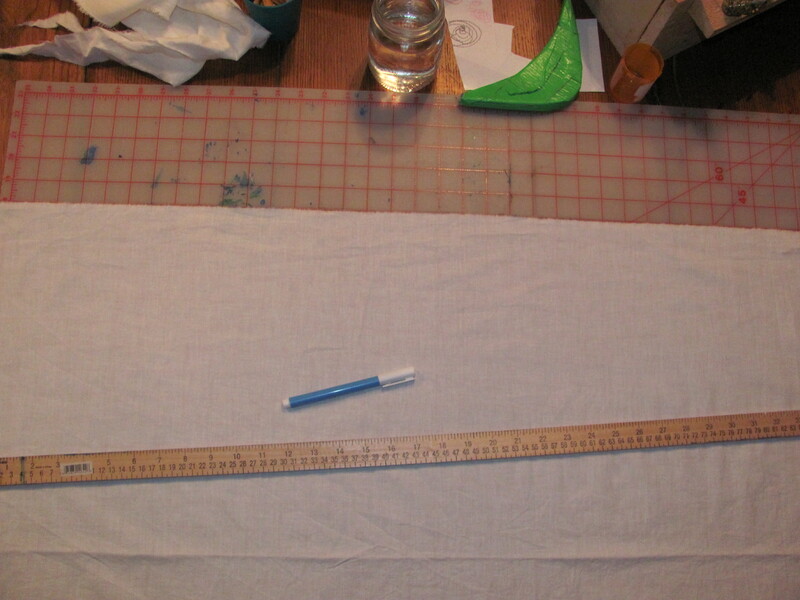 Should it always be perpendicular to the fabric? 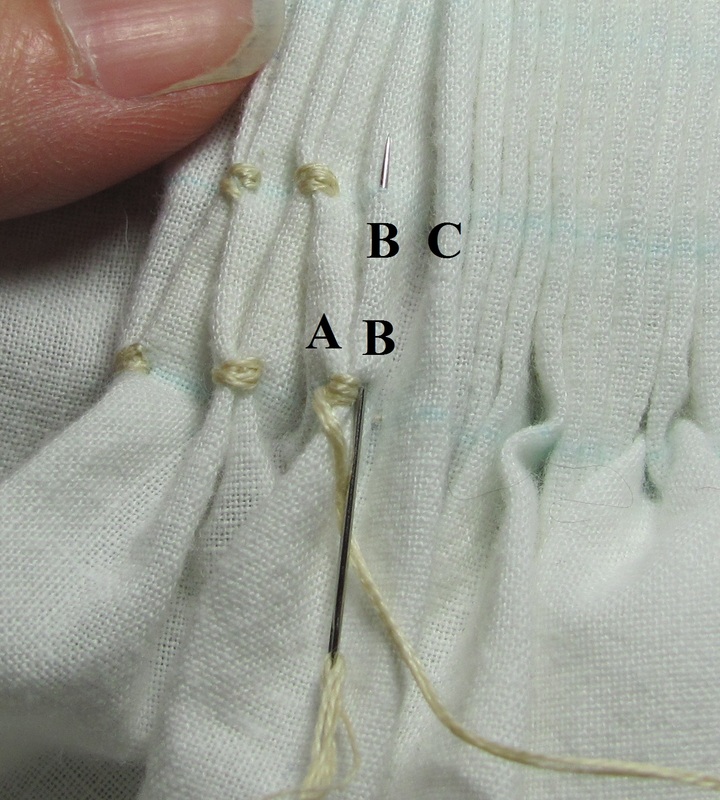 Or can I use a running stitch? And the type of needle. 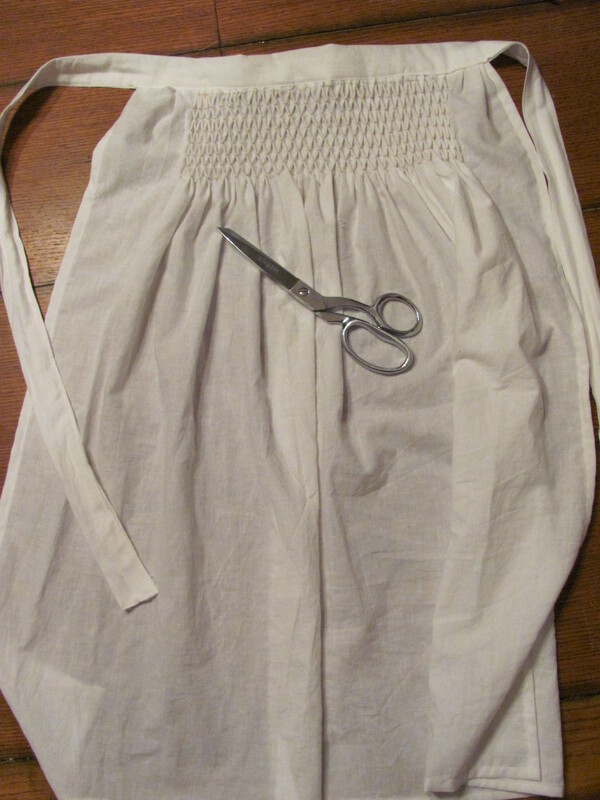 After it’s pleated what kind of needle do I use to smock? Long or short? Sharp or ball-point? I found out some of the answers, and the rest I figure I will learn by trail and error. 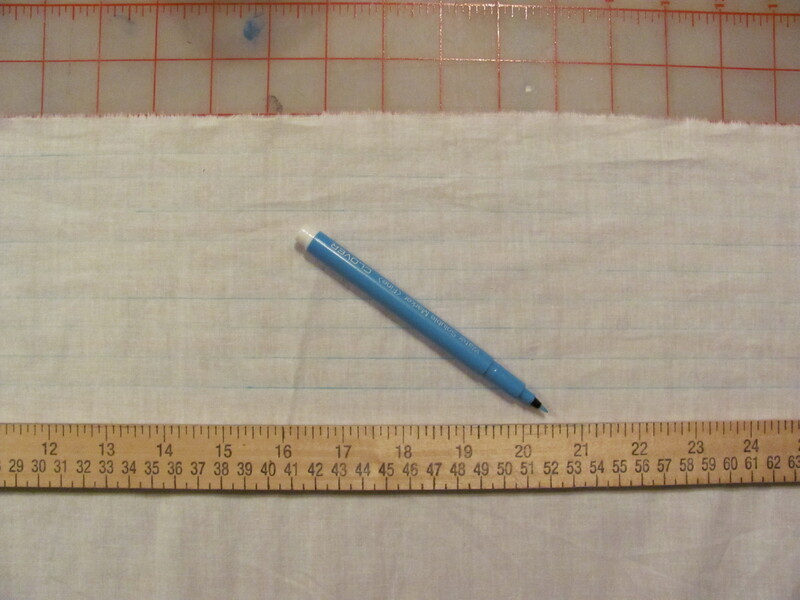 So I put my nice linen down, cut a piece of cotton muslin and decided that it’s mock-up time. What will I use my mock-ups for? Casual wear. My girls could wear them. Or I just may give one out as a door prize when I teach a class on this stuff. 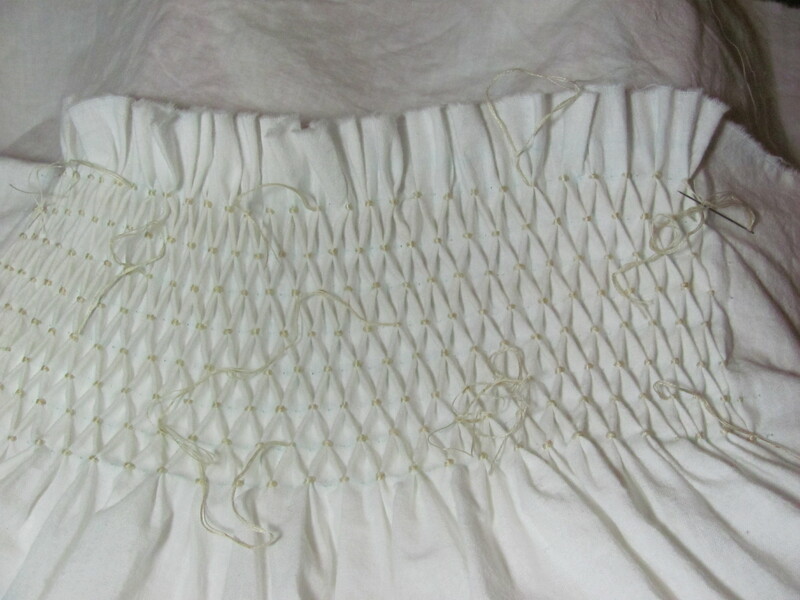 One things I did discover is that there are very little tutorials on-line on smocking from the beginning to the end of a project. So I plan on making one. 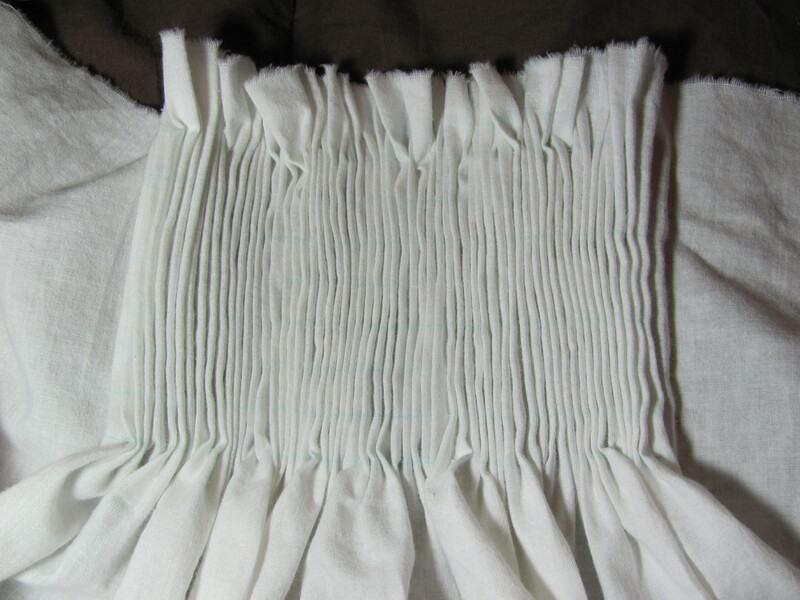 A smocking for dummies tutorial. That will come much later after I’ve learned it myself. It may seem like I flit about from one project to another, not finishing any – or at least that’s what my husband thinks. But I’m not. 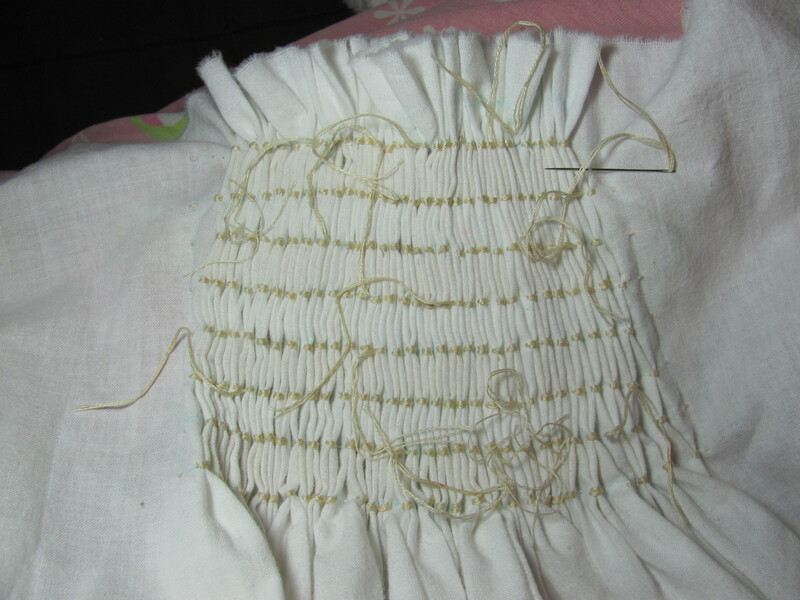 Still working on my needle-case in order to learn counted stitch blackwork embroidery. 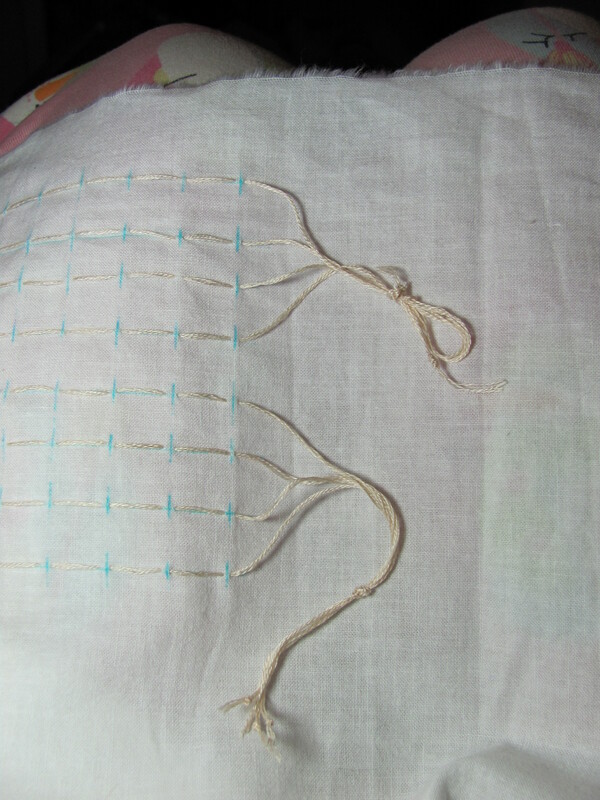 The scroll-work design has been transferred to the linen I’ll be using. I still have to decide on exact placement and sketch it out, but I’ll do that after my needle-case is done. I’ve felt run down for the last few days, but I was hoping it was just a low iron week. I added my vitamins back to my daily regimen in hopes that would I feel better, but I’m still tired. This morning I woke up coughing. At least with the vitamin increase, I should be able to fight off this bad boy a bit faster than normal. I’ll just cure it with some hot toddies. Ooo, and I have a grog mix I’ve been wanting to try. I do have to run out to get the Thanksgiving turkey today, but after than it’s bed for me. The realization that I will not get done with my blackwork Elizabethan coif in time to enter it into Christmas Revel’s A&S has hit me. Counted stitch blackwork is very, very slow. I’m not even half done with my needle-case cover, and all I’ve done on the coif is planned and sketched it. 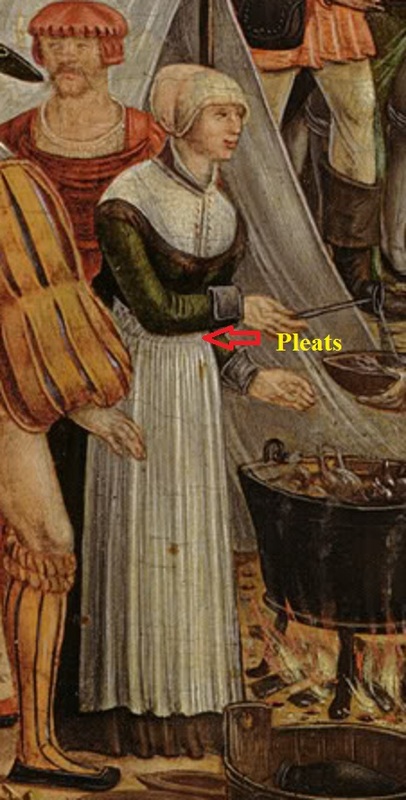 So, I spent part of last night looking through the documentation I’ve gathered for projects that I haven’t yet made, and I decided on the pleat-work embroidered apron. Since my next non-A&S compliant project is the side-laced cotte (I’m just going to machine-sew it), I want something to bling it up. 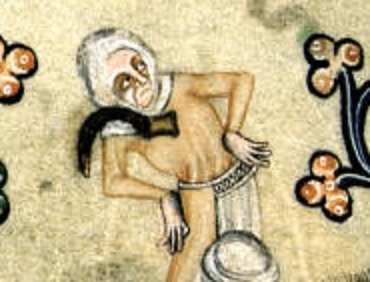 Not much jewelry was worn in the age of cotehardies. By the time they introduced waist-lines, even the girdle was not tremendously popular. However, in a few manuscripts and woodcut prints you see a very fancy apron. 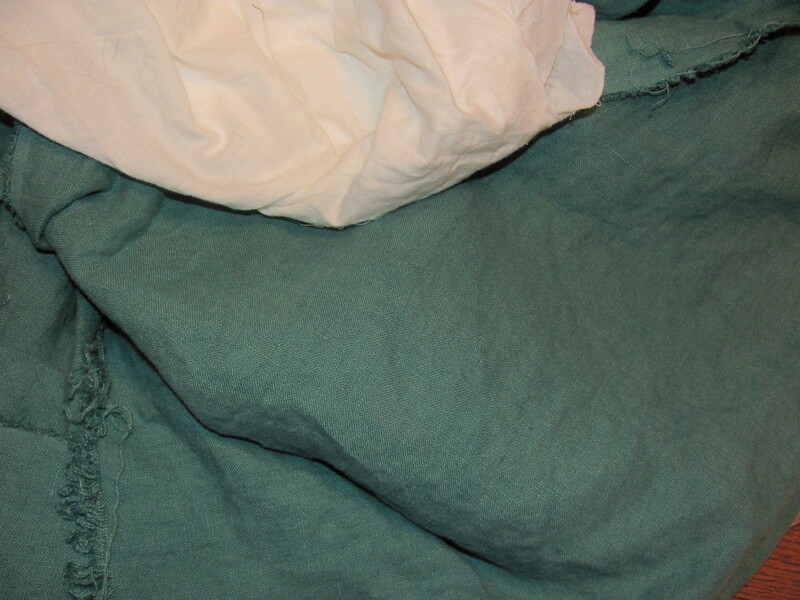 It’s white, although I have seen a couple of other colors, and it’s most probably linen. 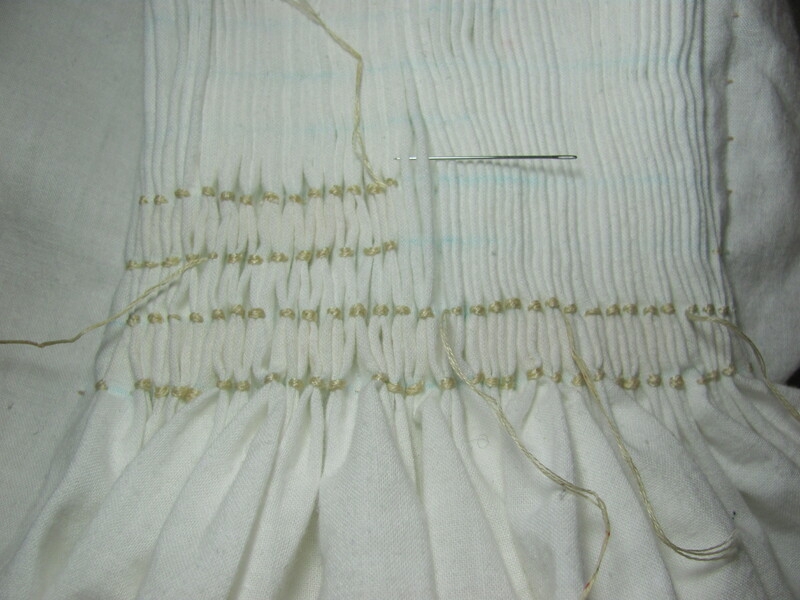 Along the top, normally gathered edge, you see pleat-work, sometimes plain and sometimes with embroidery on top of it. It looks very much like smocking in some of the pictures. 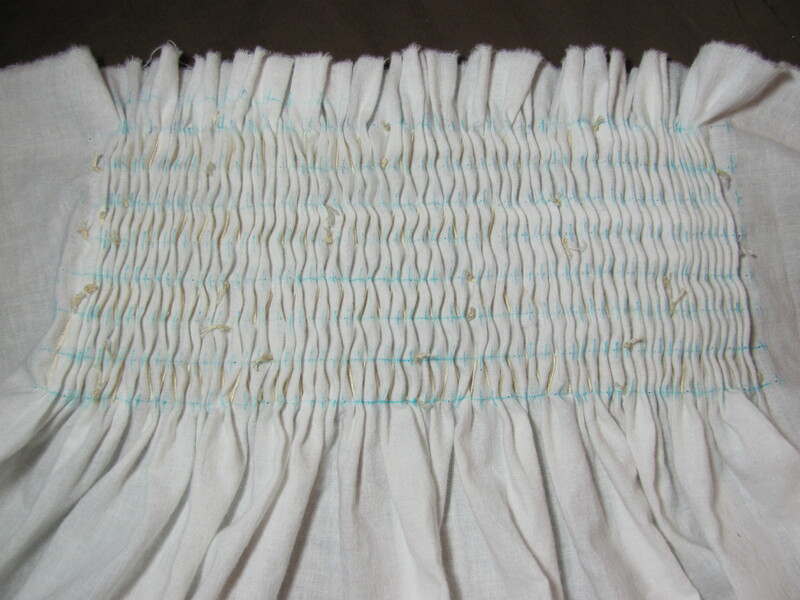 I’ve never done smocking (I’m a virgin smocker), but it looks suspiciously like cartridge pleats – rows of evenly spaced gathering stitches. 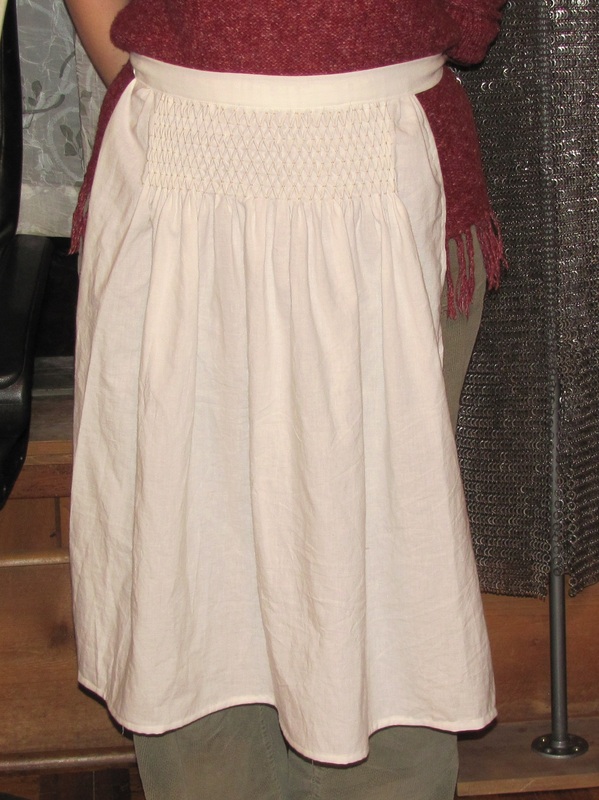 This apron is seen from the early 14th to the mid 16th centuries. So I can wear it with my cotes or my late period Flemish garb, which makes it a pretty versatile accessory. Here are a few examples. 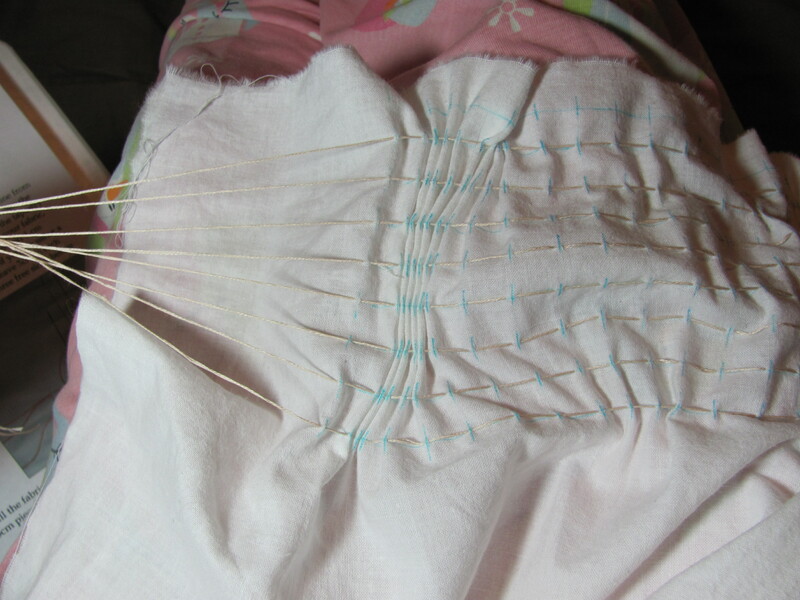 Now to figure out the how, and hopefully later tonight I’ll start the pleating.